I love using homemade soap. I love it even more because I can make it myself. Soap-making can be quite addicting. There are countless recipes and options allowing you to completely customize your soap to fit your needs and desires. My husband, however, was not exactly thrilled about using my girly scented soap, so I set out to make some manly-smelling soap just for him. He loved the result and has been using my homemade soap ever since. This is a cold process recipe, however, if you prefer to make your soap using a hot-process method, this recipe should work well for that too. Lye is a necessary part of the soap-making equation. Soap is the result of a chemical reaction between lye (that has been activated by water) and an oil or animal fat. This reaction is called saponification. 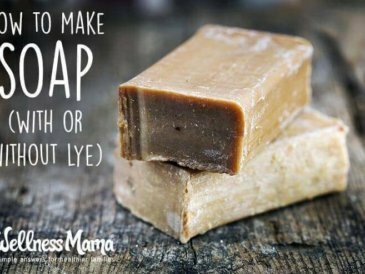 You cannot make soap from scratch without lye but with a properly calculated recipe, no lye will remain in your final product. 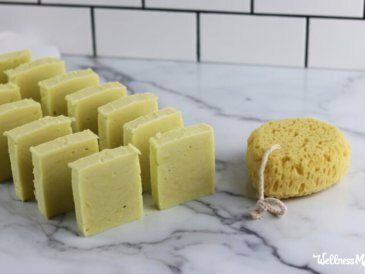 It can be intimidating to work with lye for the first time and it is definitely necessary to follow safety precautions, but don’t let that stop you from making your own soap! Wait until children are in bed. Children or animals underfoot can cause distractions or spills and working with lye is a task that should be done when they are not around. Wear protective eyewear and rubber gloves as well as long sleeves. Have a clean workspace so that nothing is ruined in case of a spill. Mix lye in a very well ventilated area. I personally do it in my back yard so that I don’t have to worry about the fumes in the house and then if I were to spill it would be outside. Always add lye to the water. DO NOT add water to lye. This will cause a caustic eruption. Many veteran soapers use the expression “snow floats on the lake” as a reminder for the order they should be mixed. As I mentioned before, there are countless possibilities when you create your recipe. For this soap I wanted a hard yet moisturizing soap with a lot of lather for my husband so I used the following ingredients. Tallow – makes a hard bar with high cleansing abilities. It is a great basic ingredient for soap. 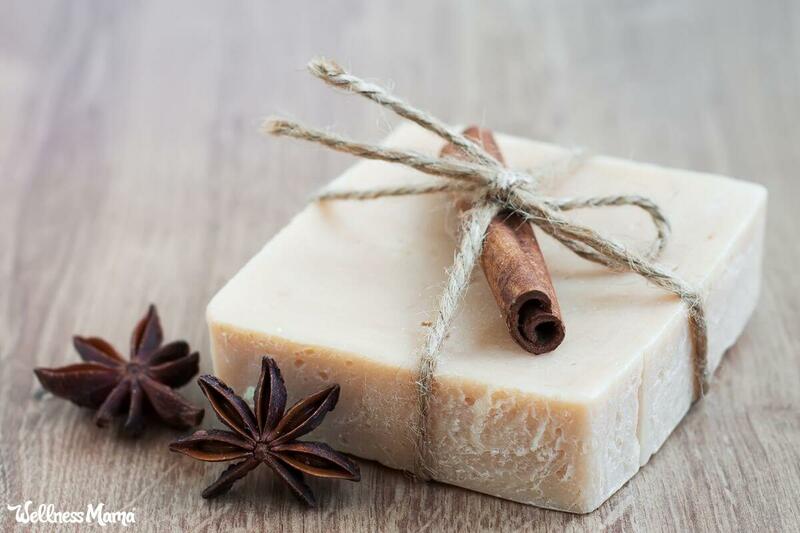 Most commercial soaps are made primarily with tallow. It is easy to render your own. If you want a pure vegetable soap you can substitute palm oil (sourced sustainably) but make sure you recalculate how much lye you will need before you begin. Olive oil – this is another classic soap ingredient. It initially makes a softer bar but with age can become quite hard. It is very moisturizing but does not have the best lather. Coconut oil – gives a wonderful, fluffy lather but can be drying so it is best kept to no more than 30% of your soaping oils. 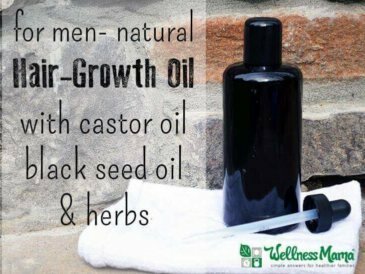 Castor oil – I almost always include castor oil in recipes that contain coconut oil because it helps stabilize the lather made by the coconut oil. Use no more than 10% to avoid creating a lather that feels a bit slippery. Beeswax – adds to the hardness of the bar. 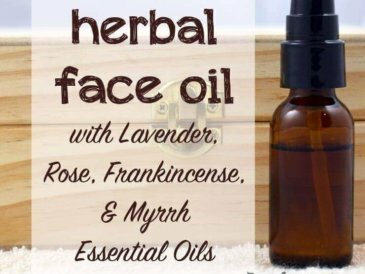 Essential Oils – your choice for desired scent. 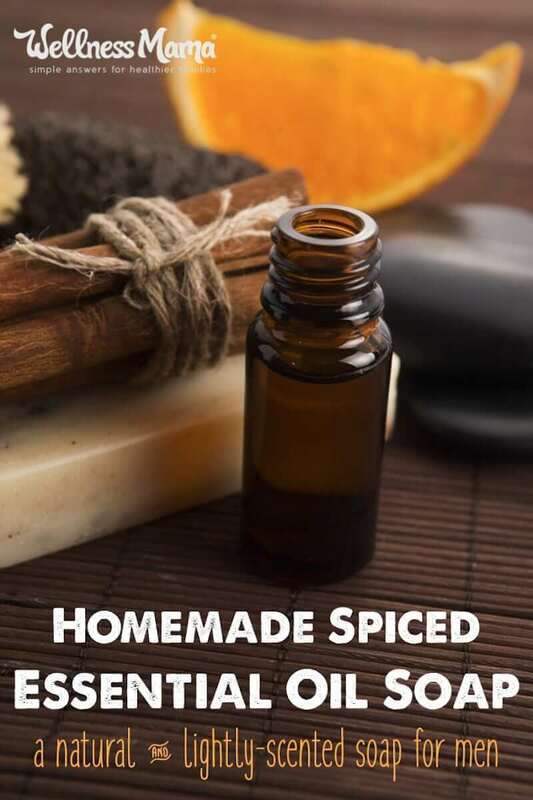 I used orange, patchouli, cinnamon, and clove essential oils to create a manly spiced scent. Patchouli helps to anchor other scents so that they last longer. I only used a very small amount of the cinnamon and clove because these oils are potent and can speed up trace, which can make it difficult to get the soap batter into the mold. I have a set of supplies I keep on hand for making soap. You can use your kitchen tools if you are diligent about cleaning them thoroughly but I prefer to keep them separate. All quantities are measured in ounces by weight. This recipe makes 3 pounds of soap. Prepare your mold. If you are using a wood mold it will need to be lined with wax paper. Silicone molds are ready without any special preparation. You can also use any box if you line it with wax paper or a thick garbage bag. Wearing your protective gear, place the glass jar on the scale and tare your scale. Pour distilled water into the jar until it reads 10.9 oz. Set aside. Put the second jar on the scale and tare the scale. Wearing your protective gear, carefully pour lye into the jar until your scale reads 4.39 oz. While the lye is cooling, measure all other ingredients EXCEPT the essential oils and warm them together in your pot or slow-cooker. The beeswax will take the longest to melt. Once it is melted, remove these oils from the heat and let cool until 100 degrees. I use the infrared thermometer about every 5-10 minutes to test the temperature. This works really well. A candy thermometer placed in each container also works. If one is cooling faster than the other you can put your oils back on the heat source or the lye/water mixture in a warm water bath to slow the cooling process a bit. Ideally, you want the lye water and the oils to both be around 100 degrees and within 10 degrees of each other. 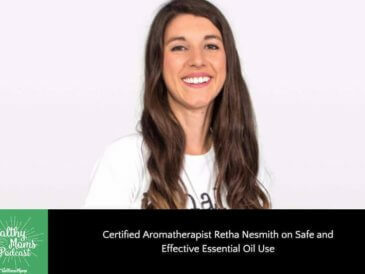 If you are adding essential oils now is the time to do so. Blend essential oils in by pulsing the immersion blender a few times. This should bring the mixture to a medium trace. You can tell when you have reached a medium trace by lifting your blender up out of the mixture (in the OFF position) and observing how the drips behave. They should sit on the surface without sinking back in. Pour the soap batter into your prepared mold. Remember that the soap is not fully “cooked” yet at this point and could still irritate your skin so you should still be wearing your gear. Place an upside down cardboard box over the soap and cover with a towel. If you live in a warm climate the towel may not be necessary. Let sit for 24 hours. You can then un-mold your soap and cut it. This makes about 10 bars each weighing just over 4.5 oz. What essential oils do the men in your life prefer? Have you ever tried them to make a soap for men?